Although a browser is one of the most frequently used programs on your computer, device or phone, not a lot of people understand the importance of securing them. A lot of people simply click on the "icon" that takes us to the Internet & that's as far as it goes. And in a way, that's enough. Most of us simply get in a car and turn the key...we don't know what kind of engine we have or what features it has...it takes us where we want to go. You use a browser to search for, view and even edit documents, videos, photos, files and all the other wonders the Internet has to offer. In some ways, you could think of the web browser as the window of a house - you can use it to look out at all the 'scenery' of the Internet, but if the window itself isn't secured, a burglar could also slip through it into the 'house' that is your computer and steal information or leave ‘bad’ things like bombs behind that may explode sometime after they leave. Browser security is an important part in keeping your information safe. Your browser security settings are an easy way to help make your time online that much safer. Updates can be for security purposes to help block some of the latest attacks or they can be updating to a new option available or look. It’s important to ensure that security updates are applied when they become available. 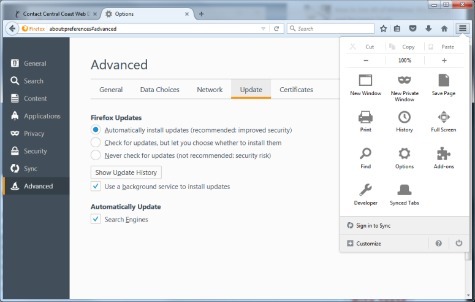 Using Google Chrome or Mozilla Firefox - set them to receive automatic updates. Google Chrome will automatically update when you close it – if you are prompted to Re-launch it, do so. To check manually, open Chrome, at the top right, click More, Click Update Google Chrome. If you don't see this button, you're on the latest version. Click Relaunch. Click on the three horizontal bars top right -then Options Next on the left side menu, Advanced/Update & make sure automatically install updates is selected. Windows 10 - Microsoft Edge is their latest browser, however it needs some settings to be secured: From the start button, click "Settings" and then click "Privacy" and click the "General" tab on the left sidebar. Under that tab you'll see a few sliders where you can toggle certain features on or off. The top toggle button is the most important as it disables the advertising ID for each user. But, if you want to cover your bases, you should go ahead disable the rest of the options as well. Browser Plugins need to be kept updated & remove any that you don’t use. In the settings of your browser, make sure that you have checked the option: Send a “Do not track” request with your browsing traffic. Installing extra security programs that will flag search results as safe or un-safe. Keep at look out for our next post which will explain what Private Browsing does & how to use it.What is Private Browsing?